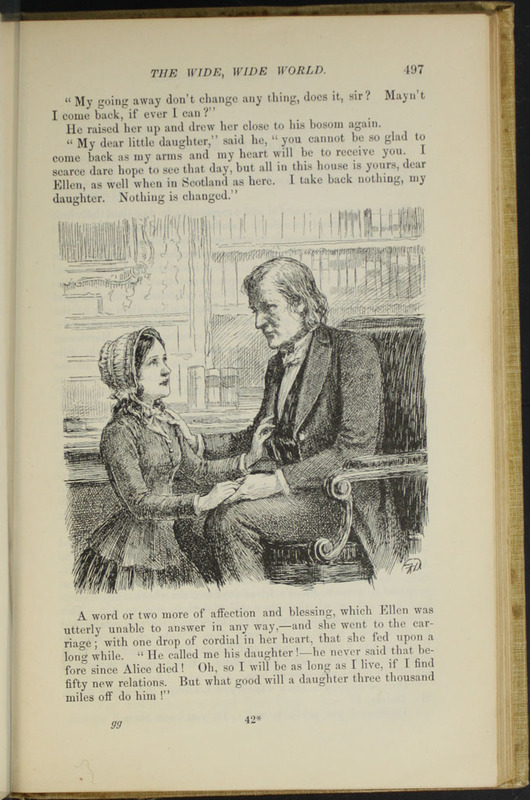 This black and white illustration appearing on page 560 of the 1892 J.B. Lippincott Co. "New Edition" reprint, depicts Ellen reuniting with John in Scotland. 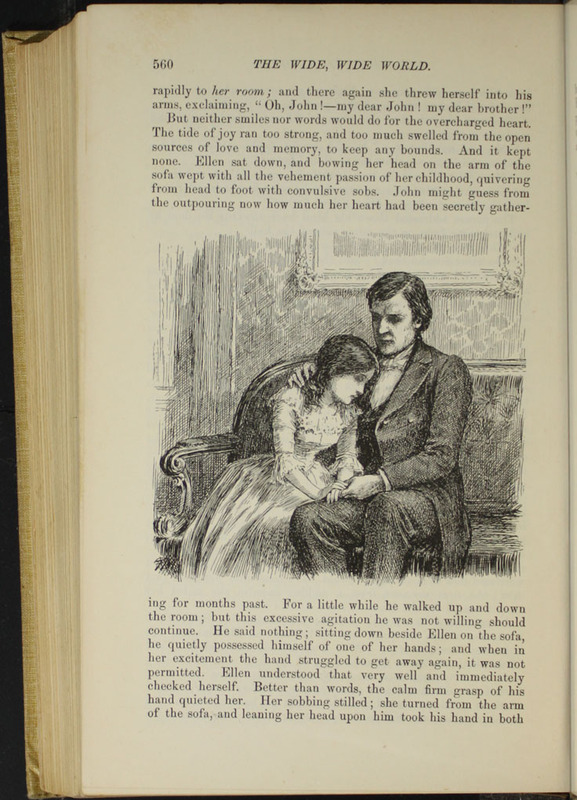 In the illustration, Ellen and John are sitting on a sofa. Ellen's white dress is a stark contrast to John's dark suit. Ellen is resting her head on John's shoulder and John resting one of his hands on hers and his arm is around her shoulders. 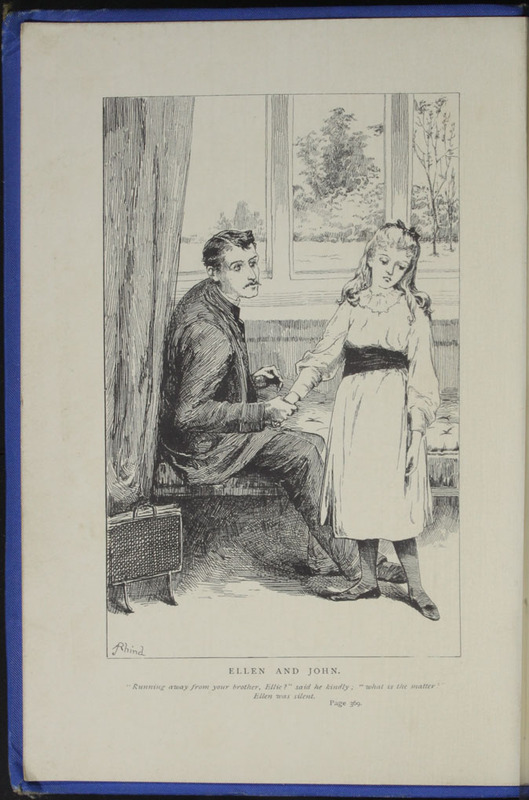 This black and white illustration on page 497, of the 1892 J.B. Lippincott Co. "New Edition" reprint, depicts Ellen saying goodbye to Mr. Humphreys. 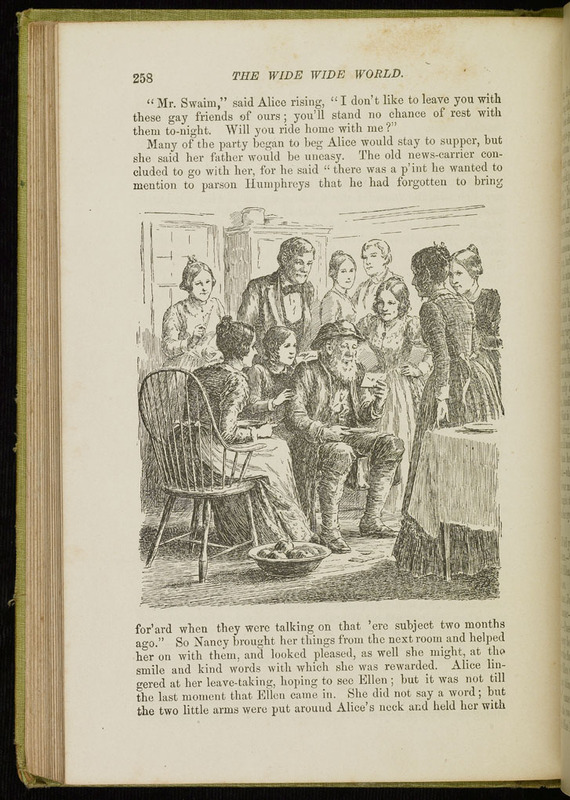 In the illustration, Ellen is kneeling before a sitting Mr. Humphreys. They are clasping hands and Mr. Humphreys has his other hand on Ellen's shoulder and Ellen is resting a hand on his suit jacket. 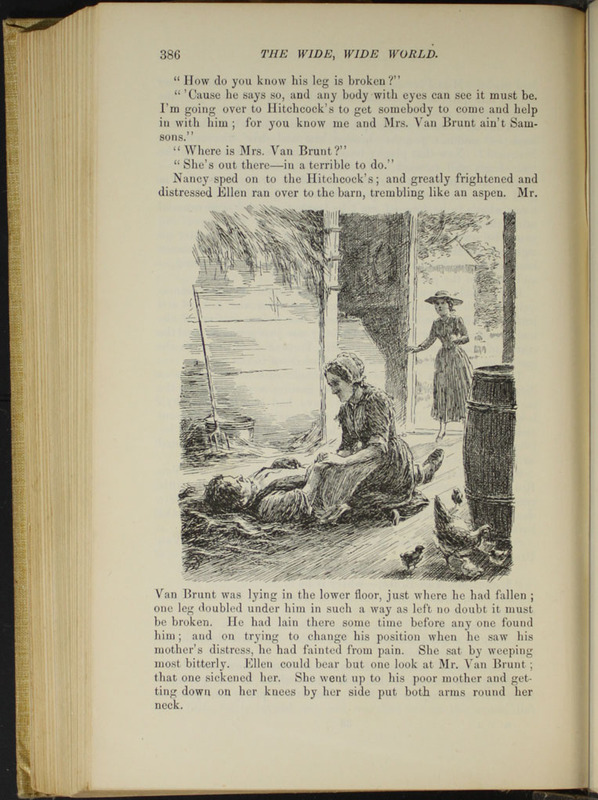 This black and white illustration appearing on page 386, of the 1892 J.B. Lippincott "New Edition" Reprint, depicts Mr. Van Brunt on the ground in a barn, injured, with Mrs. Van Brunt kneeling beside him, while Ellen enters the scene through the open barn door. Mrs. Van Brunt holds Mr. Van Brunt's hand to comfort him. In the right bottom corner of the illustration, a mother hen watches over her chicks. "Ellen and John", "Running away from your brother, Ellie?" said he kindly, "what is the matter?" "Ellen was silent". 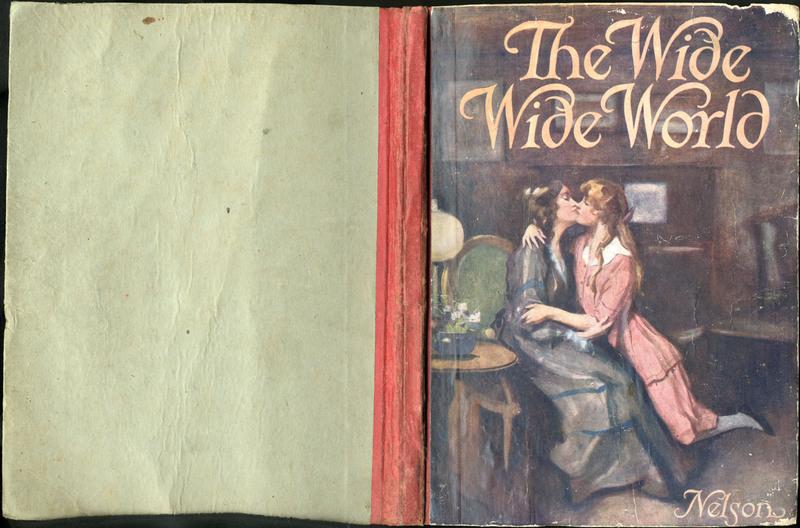 The caption references page 369 of the text. 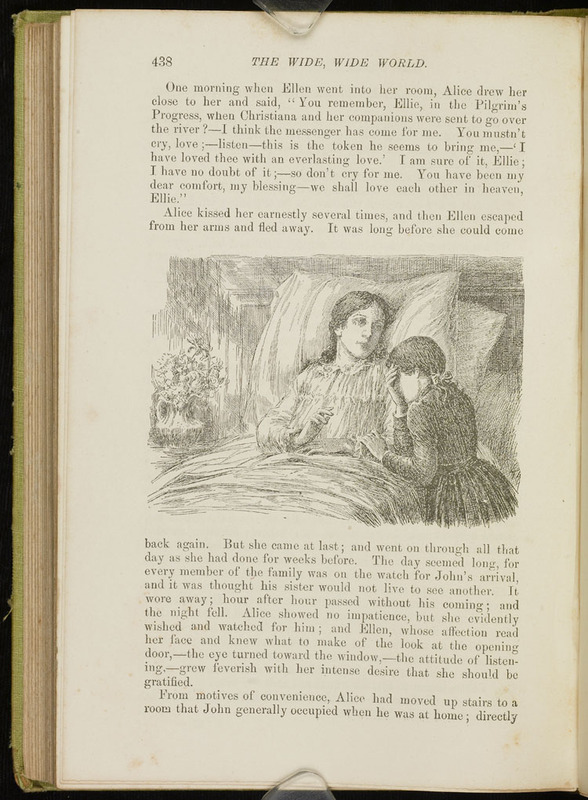 This black and white illustration appearing on page 438, of the 1896 Hodder and Stoughton Reprint, depicts Alice's death bed, with Ellen weeping next to her. Alice's face is pale and serene, her eyes are open, and her right hand is lifted up as if to comfort Ellen. Ellen holds her left hand, while she covers her grief-stricken, shadowed face with her right hand. This illustration first appeared on page 438, of the 1892 J.B. Lippincott "New Edition", (see 9CIA). 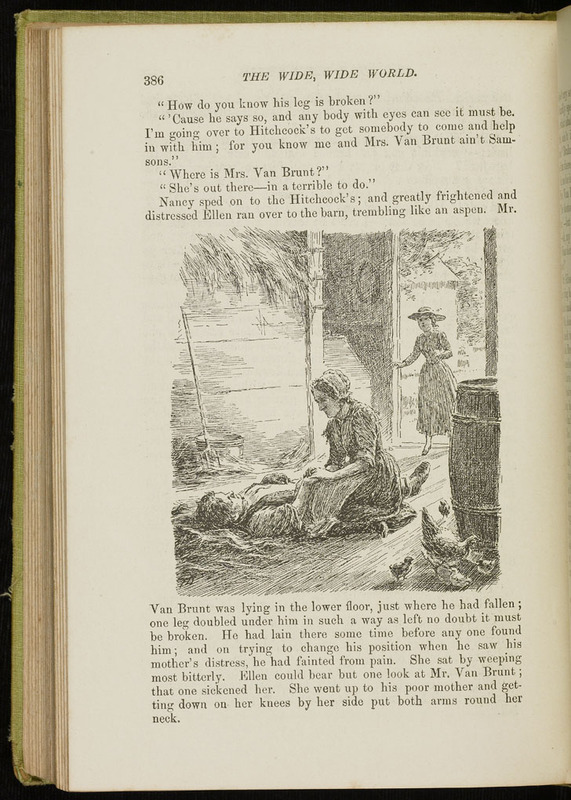 This black and white illustration appearing on page 386, of the 1896 Hodder and Stoughton Reprint, depicts Mr. Van Brunt on the ground in a barn, injured, with Mrs. Van Brunt kneeling beside him, while Ellen enters the scene through the open barn door. Mrs. Van Brunt holds Mr. Van Brunt's hand to comfort him. In the right bottom corner of the illustration, a mother hen watches over her chicks. 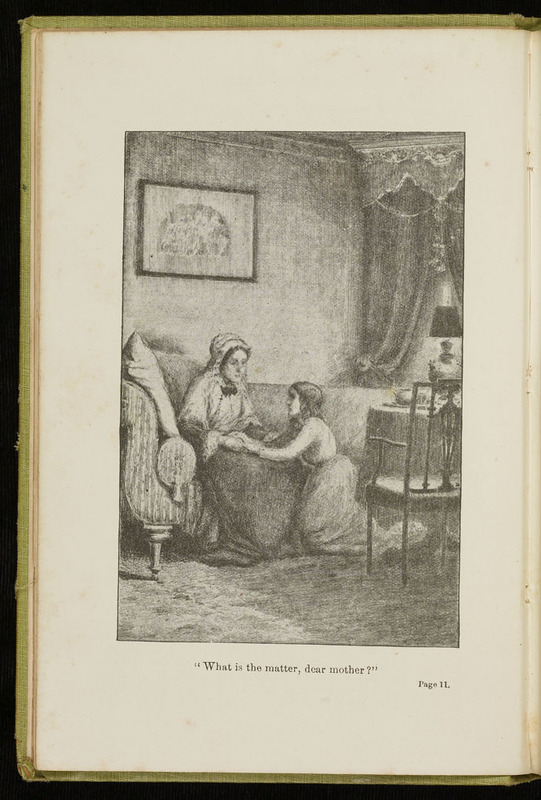 This black and white illustration, appearing on page 375 of the 1896 Hodder and Stoughton reprint, depicts Ellen meeting The Brownie. Ellen stands next to Ellen Chauncey as Sophia Marshman watches Ellen from a distance. Thomas leads The Brownie to the front of the porch where Ellen can see him. 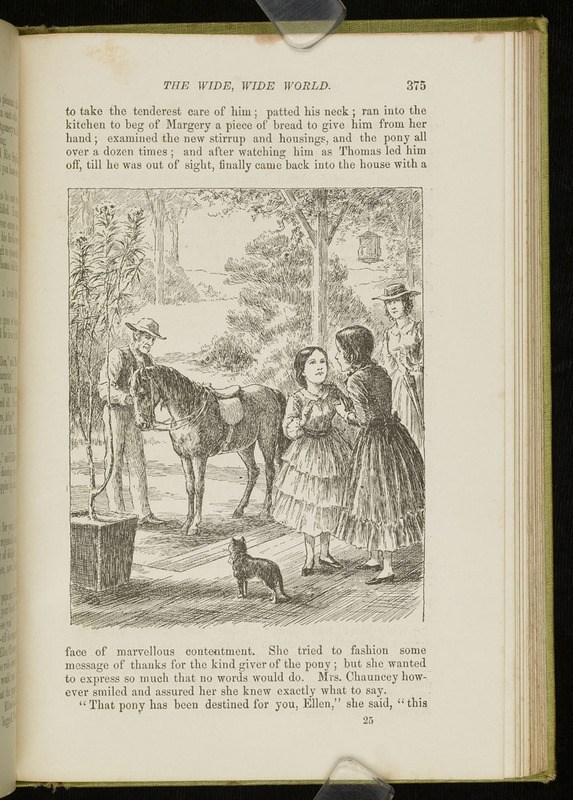 Captain Parry, Alice's cat, stands near Ellen's feet. Several trees and bushes stand behind The Brownie, and an open field extends into the distance. The busyness in the foreground of the illustration, accentuated by the multiple characters appearing in the scene, is relieved by the landscape in the background as the scene opens up into nature. This black and white in text illustration appearing on page 258 of the 1896 Hodder and Stoughton reprint, depicts the letter carrier appearing at the apple bee. In the illustration, Father Swaim sits in the middle of the crowd attending the apple bee, every one leaning in to look at the letter he is holding. Ellen sits to Father Swaim's right, lightly touching his arm and leaning in to look at the letter. Alice sits to Ellen's right in a chair, a bowl of apples sits next to her on the floor. Aunt Fortune is sanding to Father Swaim's left resting her hand on the back of his chair and looking the letter he is holding.